Here we are! It's finally time to kick off our first challenge over at Fusion. I'm always looking for great challenges, and I have to say, I love what Jackie and Leslie have come up with. The whole concept is amazing. I really think all of you will like it too. I am on Jackie's team so I will be doing a sketch each week. For my card I used a piece of pattern paper for my chevron. After I had that part done I started looking for something that would represent the two dark squares in the sketch. I die cut a couple of butterflies, stamped them and then attached them at just the body with foam tape. Then I gently folded the wings up. Here are this week's sketch and inspiration photo. I hope you will join us this week and help us kick off this super fun challenge. Deanna your card is gorgeous, but i'm not surprised. I am loving all the new SU ink you have been using. This is going to be fun. Hi Deanna, I'm so glad to have found your blog. Loads of inspiration for me here! I'm excited to see this new challenge and hope to play along. Sketch challenges are the hardest for me, so this will help me work on that. Love your card. The simple butterflies are perfect with the chevron. This card is fabulous Deanna! I loved it the first time I saw it on the DT blog! Beautiful colors and perfect take on Jackie's sketch! I love this...the chevrons and butterflies are perfect! Awesome card!! Love the chevron and butterfly combo especially with those colors! What a way to kick off the challenge! GORGEOUS!! Love your card Deanna! You inspired me to dig right in...I think this will be a favorite challenge! thank you for the sweet comments on my blog...you always "lift me up" with your kind words! Totally to die for patterned paper, and those shades of blue and green are so charming together! 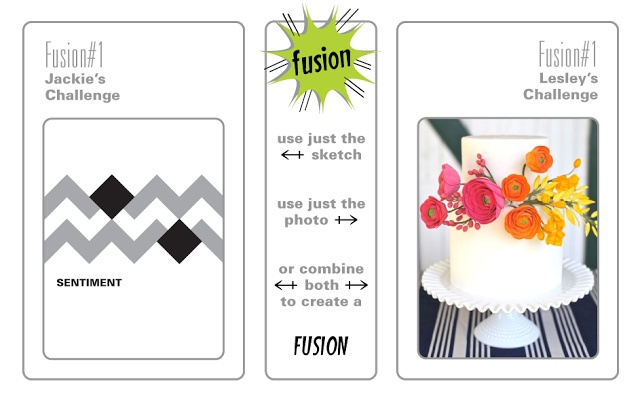 So excited to be on the Fusion (well, actually the sketch) challenge with you Deanna! This is such a pretty card Deanna, your style is always impeccable!! I love your design for this new challenge, Deanna! This is another keeper!! So thrilled that you are no this new challenge design team. I always love your work! this challenge looks like a lot of fun! pretty card! I love this! The butterflies were the perfect answer to the squares in the sketch :) gorgeous!